Here's a complete overview of the King's Canyon map for Apex Legends, as well as list of the best places to drop. There's a big vast map to explore and fight across in Apex Legends, and it's sometimes hard to find your way around the place. In our Apex Legends map guide, we'll be providing you with a full list of the best places to drop in Apex Legends, so you and your squad always know where to head. As of right now, Apex Legends only features one map. This map is known as King’s Canyon, and you can see an in-game screen of the map just below. At the very beginning of a match of Apex Legends, one person in your team of three will be designated as the ‘jump master.’ This person will decide when the entire team jumps out of the jet from above, and the angle that they’ll take in gliding to the ground. But, if for whatever reason you’d rather go it alone, you can hold X/Square while descending in your team to break away from the pack. Although this lets you go off in your own direction if you’re not satisfied with where you’re going, it can leave you far apart from the other two members of your team, potentially with no backup if you run into enemy players. Selecting where to land on the King's Canyon map of Apex Legends can be a tricky business. The other two members of your team can suggest where they'd want the jumpmaster to aim for by using the ping system, but it's still the role of the jumpmaster to select where to aim for on the ground below. If it’s weapons and armor items that you’re after on the King’s Canyon map, then the named locations on the map hold the best gear. Areas like ‘Market,’ ‘Skull Town,’ and ‘Artillery’ have multiple buildings in a close area, meaning there’s an increased chance of you stumbling upon an Epic or Legendary piece of gear. You'll also want to keep an eye out for the Hot Zone. 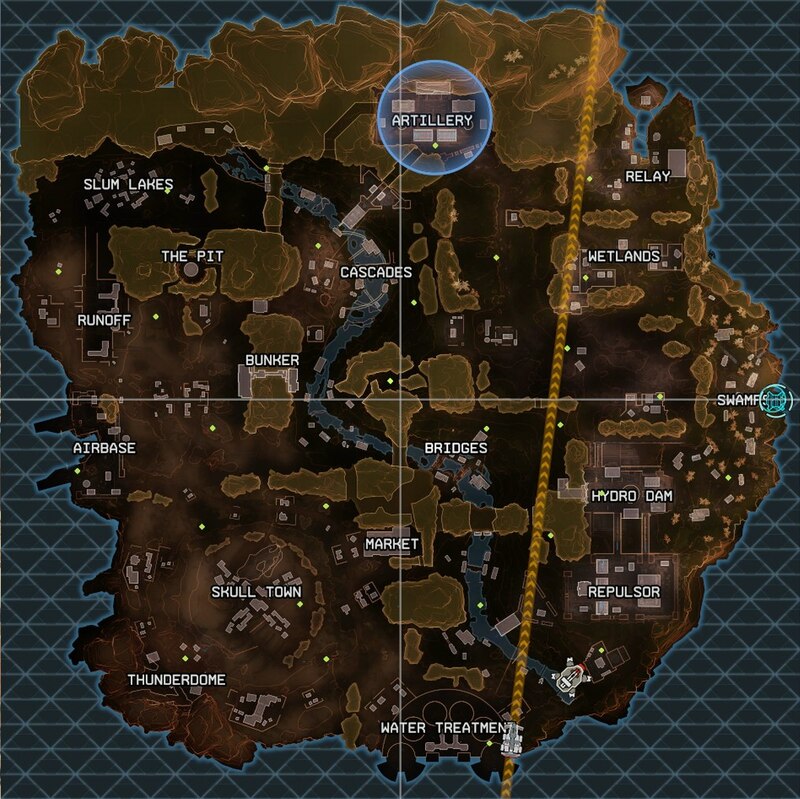 The Hot Zone is marked with a light blue circle at the very beginning of an Apex Legends map, and it's within this zone that the best weapons and armor items can always be found, without fail. The only problem with the Hot Zone is that it's available to all players, meaning everyone's going to be gunning to be the first one down on the ground within the Hot Zone, so they can collect all the best weapons and armor pieces. At the very start of the game, there’ll be a countdown timer in the top left corner of the screen. When this timer has elapsed, a faint grey ring will appear on the map. You can bring up the map by pressing the touchpad on the DualShock 4, or the view button on the Xbox One controller, to check the location of the circle. This circle basically acts as the safe area on the map of Apex Legends, and it’s this circle that you need to make sure you’re always in. After the circle has appeared the first time, you’ll notice another countdown timer in the top left of the screen, and this signifies the amount of time you’ve got left until the map shrinks down to that one circle. If you’re not within the circle by the time the map shrinks, you’re going to continually take damage. You need to make sure that you’re constantly checking up on the position of the circle, and making sure your team is inside it. But if you’re using headphones to play Apex Legends, you’ll hear that your player character actually comments on whether your team is in the circle once the position of the circle has been determined. But there are certain items around the landscape of Apex Legends that you can actually use to travel around the map incredibly quickly. If you spot a red balloon attached to the ground with rope, you can interact with the rope to shoot up it, towards the balloon. Once you’re at the top, your character will shoot off into the air, where you can glide back down to the ground, as though you were just jumping out of the jet for the first time. This is the one main trick you can use to get around the King’s Canyon map incredibly quickly. 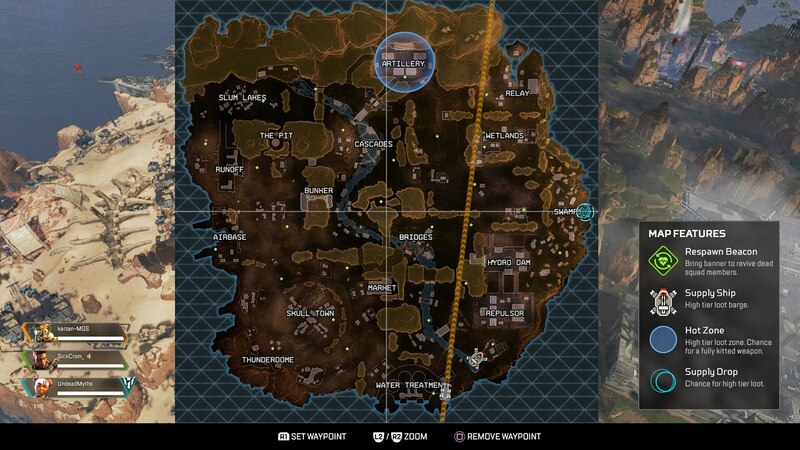 Now that we’re all done with this guide on the King’s Canyon map of Apex Legends, you can check out any of our additional guides on the game. Head over to our Apex Legends characters guide, or our Apex Legends weapons guide for more.